Okay, Okay, I know, we have not even had Thanksgiving yet, and I have not posted a single Thanksgiving party. However, I am really excited for Christmas this year and I am not sure why. Don't think I have forgotten about Thanksgiving, it's actually my favorite holiday, but I figure if you were going to have a kids Thanksgiving party, you probably already had it or at least have the invites and your theme done....I know you can do it on your own, I have faith in you! 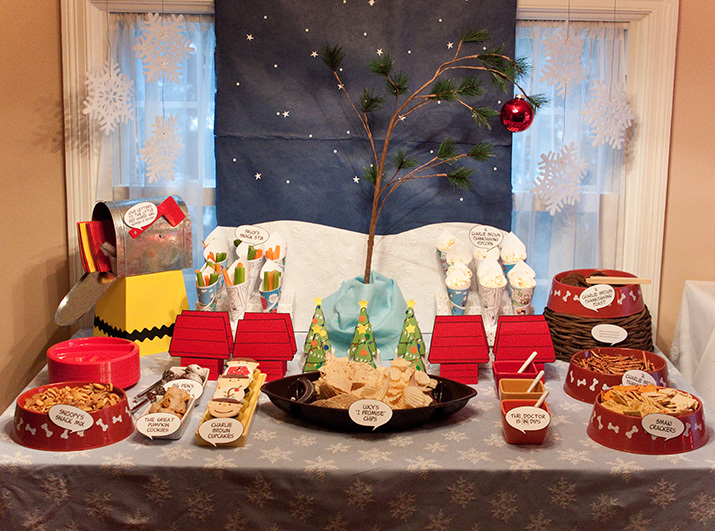 Well, this post is once again from the fabulous Hostess with the Mostess, and although it's done to a Thanksgiving theme, I thought it would be fun to do this for a kids or adults Christmas party, with a Charlie Brown Christmas Theme....can't you picture it? Face it, everyone feels bad for that poor little Christmas tree and deep down wants to take it home, well now you can have your own as a wonderful centerpiece! You could even add a blue blanket to wrap around the base of the tree to act as Linus' blanket. Wouldn't it be fun to have a Charlie Brown Christmas party with the classical cartoon soundtrack playing in the background? Or having a mailbox on your porch and have the kids check to see if their is a christmas card in there for them? Also, have some card with the names of other peanuts character on cards as well and this time why not include Charlie Brown in your party! The picture below shows just what you can do with this theme, it's from the Oink! a blog of piggy bank party's...click here to see the entire post, lots of good stuff! 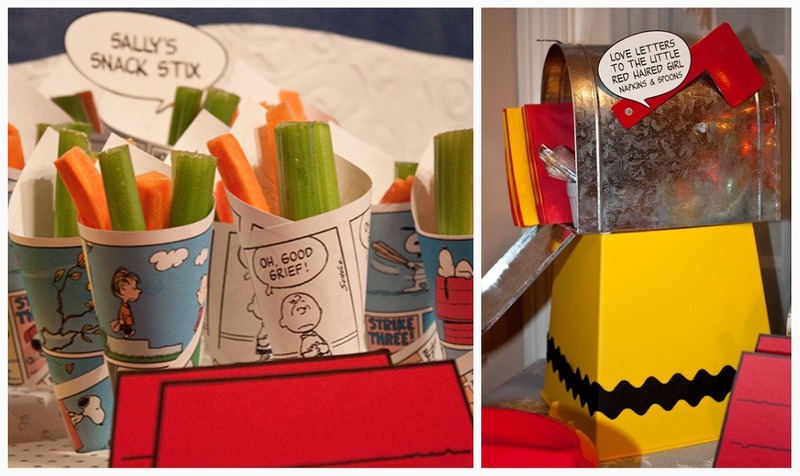 I love the printed off comics, wrapped into cones and filled with veggies or popcorn! Very Cute! Just think like a kid and be creative with this party....and most of all, have fun!